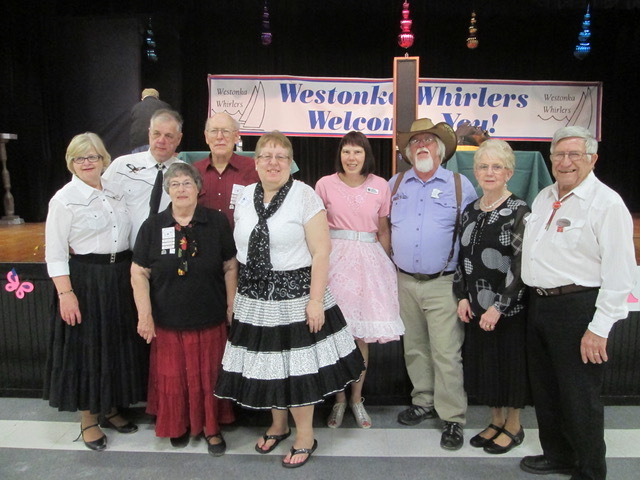 April 21, 2018 – Westonka Whirlers “Spring Time” Square Dance, Mound, Caller Bob Asp, Cuer Ray Belanger. Seven squares with dancers from Ar-Dale Dancers, County Line Squares, Crystal Cross Trailers, Dan’se P.A.C., Single Circles, Spares & Pairs, Wandering Wheels, and Westonka Whirlers were present. 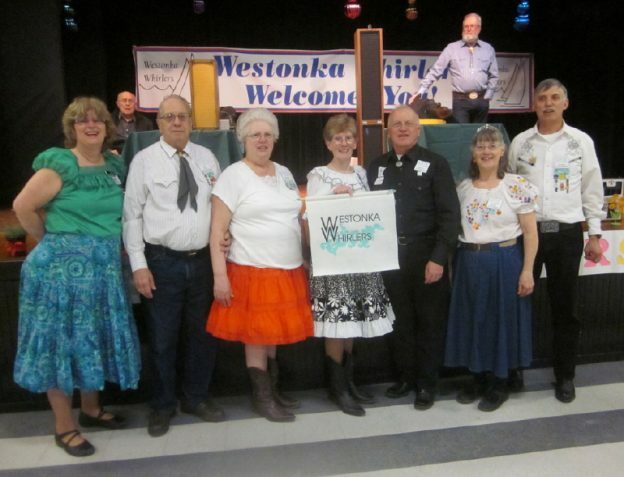 Also present were County Line Squares Queen Gael and King Doug, Spares & Pairs Queen Jennifer and King Barry, Westonka Whirlers Queen Anita and King Bill, USDA Plains Region Vice Presidents Floyd and Judy Engelhardt, CSD Chair Vince Dahlheimer, Federation Education Committee Linda Biederman-Hink, SDM Chair LeRoy Elfmann, SDM Secretary Gael Zachman, SDM Education Director Barry Downs, SDM Historian Al Martin, and SDM Marketing Director Dee Scott. County Line Squares claimed a Westonka Whirlers banner (some dancers were not available when the picture above was taken). This entry was posted in Activities on April 22, 2018 by LeRoy.